We present here complete videos of many of Adam Lambert's American Idol performances. As much as possible, they include introductory material, performance and judges' comments. Because these videos are not available on YouTube, this page has a different format than the others. Many of these videos are from our favorite American Idol blog - be sure to check it out: mjsbigblog. All of the following videos are copyright Fox - American Idol. They are shown here on a non-commercial basis under the Fair Use Act. 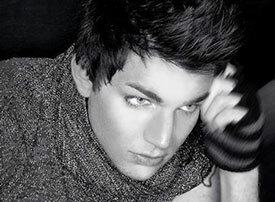 In October, 2009, we added a new page of Adam's Idol performances from YouTube. It's very similar to this page but has a couple of extra videos added. One benefit of the new page is it allows the entire playlist of videos to be played as an Adam mini-concert. If you enjoy our website, please consider becoming a fan of theBestArts on Facebook at http://www.facebook.com/theBestArts. We provide information about updates to the website, upcoming events and a "Video of the Day." Be sure to tell your friends, too. Adam sang Queen's "Bohemian Rhapsody." Singing begins at 0:55. Like many viewers, this was our first introduction to Adam. Three days later, we posted our first compilation of Adam videos, Adam Lambert Demo Reel, on YouTube. Judges loved Adam's Hollywood Week group performance of "Some Kind of Wonderful". After his performance, new judge Kara told him "You're an incredible singer. You are." On the last day of Hollywood Week, Adam sang a non-disco version of Cher's "Believe" and was passed to the next round. Finalists Adam and Kris each performed the forgettable song "No Boundaries." Here's Adam's rendition. Adam was eliminated in the finale... but Idol has helped him create an amazing career!